Explore the laws of motion using a simple fan cart. Use the buttons to select the speed of the fan and the surface, and press Play to begin. You can drag up to three objects onto the fan cart. 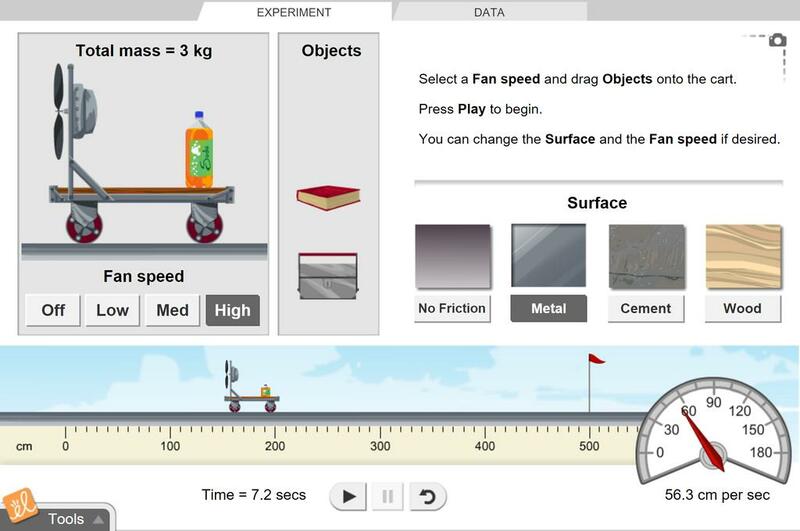 The speed of the cart is displayed with a speedometer and recorded in a table and a graph. Determine that a force is needed to cause a change in motion. Determine that larger forces cause greater changes in motion. Claim, evidence, reasoning prompt using Force and Fan Carts Gizmo. Students will test different surfaces ... (more)that a fan cart runs on, collect evidence, and provide reasoning for their evidence. This worksheet was designed with a table for students to work through as they did this Gizmo. The document includes 4 inquiry-based activities for student groups to investigate and then "share out" (... (more)Communicate) their findings. While sharing, reinforce science content concepts (force, mass, speed, and friction), "fair test" design (variables and controls), and data analysis and collection. I like how visual it is. Very Chronological. It fit very well with what we were doing in class. This Gizmo is a great virtual lab for students, both general ed and advanced! This Gizmo was not only a great way to experiment with friction and force, but also reinforced how variables work in an experiment. Great GIZMO for learning about Forces. The surfaces really help! EXCELLENT GIZMO to teach about forces, friction and speed... My 8th graders learned a lot and had a blast!